Yes, those are cows out my car window. 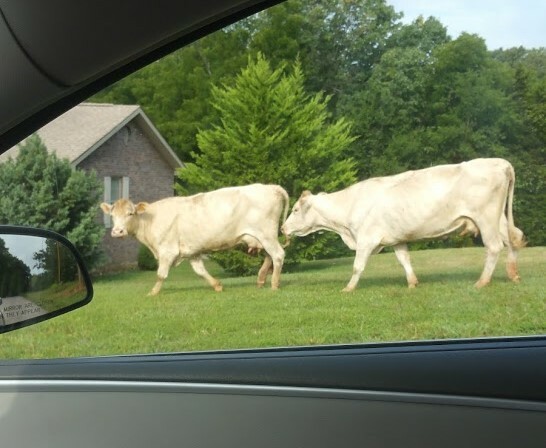 We live in the country but still….cows wandering the roads freely isn’t exactly normalcy. But dreaming about them……totally normal for any up and coming homesteader. Promise. For three years I have wanted a dairy cow. The first time I came home with that “worth it’s weight in gold” raw milk with three inches of cream sitting on top just waiting to be put in my coffee….yeah…I was sold. Chad…..not so much. His motto is that he would pay someone $20 dollars a gallon not to have to be tied to a cow twice a day ….everyday. Please don’t tell our dairy farmer, even if his milk is worth it’s weight in gold. But alas, Chad is right. The reason dairy breeds have to be milked twice a day is because over time they have been bred to produce more and more milk. To an average of around 6-8 gallons a day. Their utters simply can not withstand being milked less than that. So, if we had just one cow we would receive around 42 gallons a week. Whoa. With that much milk coming in we would need to find quite a few people willing to buy a share in our cow (the only legal way to sell raw milk in our state) which I believe would be easy, but such a big responsibility is just not possible at this moment. In my dreams bovine were 10 years away. I’ve already waited three, so now we are down to seven. YES!!!! Then it changed to five years because I wanted the girls to be able to have this experience. It’s totally not for me at all. Promise. Recently Chad was at lunch with his friend, we will call him “Sheldon”, and they were talking about being self-sufficient and homesteading. I am sure Chad told him of my dreams of a dairy cow that he was not exactly looking forward to, but knew how much I wanted one. “Sheldon” proceeded to tell him about Mini Jersey milking cows. A much smaller, more manageable animal that produces 1-2 gallons a day. And …people….you won’t believe it. Chad came home to tell me about it and actually liked the idea. Because it made sense for a family who goes through about a gallon a day. I love my rational husband. If it weren’t for him I would have like 20 milkers. Which is “only” 840 gallons a week. That’s why God gave him to me…to “help” me. The link above is a documentary on Mini Jerseys. I learned a lot about them and think they are the perfect cow for the family homestead. If you think bovine don’t fit into your current homestead (or soon to be homestead) I would encourage you to look into these sweet little girls. Most are handled like pets on a leash, they are that docile. As of this moment the dairy cow has now been moved to the two year plan! And if I could build a perimeter fence and barn sooner I would shoot for sooner. But alas, some things just take time. Until then, I will just be sitting here dreaming.